Easter is April 21 this year (late!) and that means you still have plenty of time to put together some special learning experiences for the most special time of the church year. Our Writing Team Holy Week Lesson Sets are full of fresh lessons --many of which can also be used in intergenerational learning. Now would also be a great time to become a Supporting Member and get access to the Team's extra creative Holy Week lesson sets. Our public Holy Week forums are also bulging with great ideas and lesson plans. New expanded access to teacher training materials! The "Paste in My Hair" Teacher Training Blog is NOW OPEN to all registered as well as supporting members thanks to a grant from a teacher-training loving church. Later this spring, the training resources will be moved into a larger forum and start to expand with new content to share with your teachers. ♦ Does Your Teaching Have a JESUS Gap? Our Board's annual meeting is March 18 and 19th and we'd like your feedback about the site, suggested improvements, and hoped-for resources. Post your suggestions here or email contact.rotation@gmail.com. About three times a week we post links to new resources and great "old" ones at our site. Liking and Following us will deliver them to your newsfeed. They include "seasonal" reminders of hidden treasures at our site that fit where we are in the "Church Year." One month into my term as president of our volunteer board and I am thrilled to see so many people continuing to work hard at bringing amazing materials and ideas to our members. I have been getting ready for the Board's annual meeting in March and I would love to get your feedback on our site, and how we can better serve each other. Are there Bible lessons, subjects, or training resources you'd like to see? 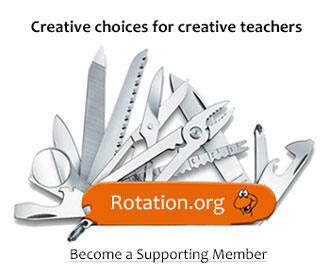 Would you like to see Rotation.org sponsor a face-to-face conference? Post your suggestions to me. My own church, Faith Presbyterian Church in Mandeville Louisiana (just across Lake Ponchartrain from New Orleans), is launching the Workshop Rotation Model at the end of March (my third time implementing it in a church). It's both exciting and scary to have a blank slate, but we're looking forward to using the WT lesson sets and other great ideas in our public forums for our curriculum. If you live in the Gulf South, drop me a line so we can get together. A personal note of thanks to out-going president (and not-allowed-to-leave) Luanne Payne. You've been a role model of creativity, leadership, and encouragement to me, the Board, and countless others at our site.